Colour+: It is, Indeed, Fantastic! Be prepared to laugh out loud as you colour Colin's images. I guarantee you won't get past the cover without a smile on your face. Check out those book titles! 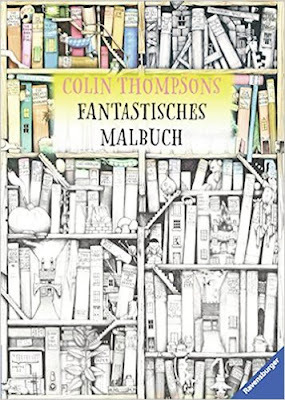 If you're not familiar with Colin Thompson's picture books, I recommend you get along to your library and borrow a few for an entertaining read, often with an underlying serious message. In particular, look out for "How to Live Forever" as several of the images are in this new colouring book. Who will love it - those who like colouring fantasy, those who love Colin's picture books and jigsaws and those who like humour in the images they colour. What a very enjoyable book this is. Truly Fantastiches! The images are collected from several of Colin's picture books and jigsaw puzzles. Yes, there are jigsaws, including an 18,000 piece one if you want the challenge of a lifetime! There is also an English title edition of this book, Colin Thompson's Colouring Book, but you'd have to hunt it down. It makes no difference really as all the book titles in the drawings are in English anyway. This book doesn't tell a story as his picture books do but you'll find endless snippets to enjoy. In fact, I don't think you really "know" his pictures until you've coloured them. In the image I coloured above (which is from the cover of his book "The Tower to the Sun") I could recognise many famous buildings as I coloured. There is a lot of shading already in the images in this book. I suppose you could liken it to greyscale photos. I love colouring these sort of images as you just add darker colour over the darker grey bits, so many of the decisions are already made for you. 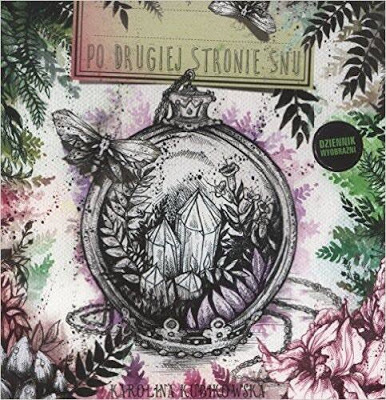 In that respect, this book is similar to Po Drugiej Stronie Snu. The drawings are obviously quite detailed but easily manageable. The images are all on double-sided pages and mostly double page spreads. While the images go into the spine, the glue binding is loosening up to get into the spine without too many problems. The paper is white and good quality. Water based pens should be okay if used carefully, but there isn't really anywhere for you to test them out in this book. I coloured the above image in pencil as I didn't want to colour over any interesting details in a darker colour that might obscure them. Most of all - have a laugh!